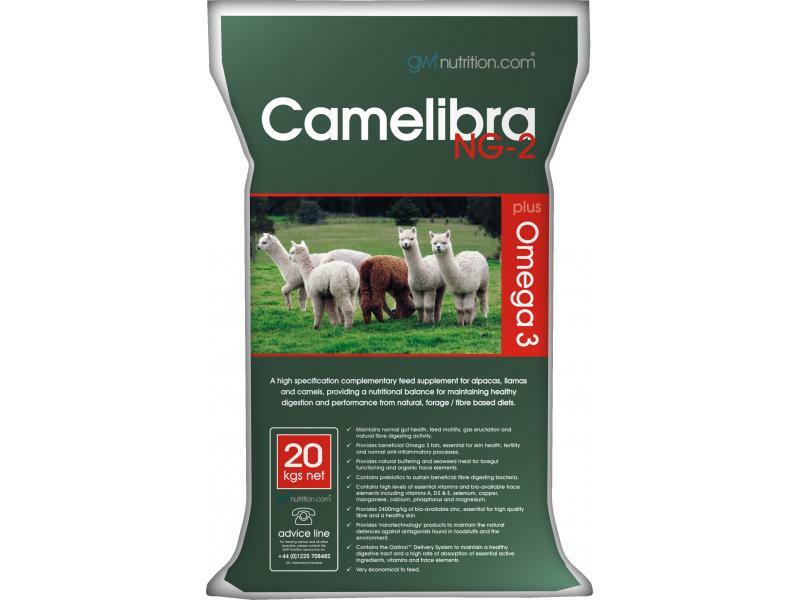 Camelibra NG-2 is a high specification complementary feed supplement for all camelids; providing the correct nutritional balance to maintain healthy digestion and productivity from natural, forage/fibre based diets. Contains 10 active nutraceuticals, including: bio available trace minerals, nanotechnology components and simple sugars 'oligosaccharides', natural buffering and yeast culture, omega 3 fatty acids, prebiotics, vitamin D3, phosphorus, calcium, yeast cultures and a blend of galactolipid emulsifiers, tocotrienol antioxidants, beta glucans and phospholipids. Is manufactured as very palatable and easily digested 2mm pellets; perfect for mixing with camelids' normal feed. Is very economical, quick and easy to feed. Natural Buffering and Yeast Cultures Natural buffering and yeast cultures help to stabilise the pH in the foregut and encourage the development of beneficial fibre degrading bacteria. This is important when feeding cereal based feeds as starch is converted into lactic acid, which can increase acidity and create an unfavourable environment for the fibre degrading bacteria. Omega 3 Fatty Acids Omega 3 fatty acids provide a daily source of essential fat components. Omega 3 is widely recognised to be an anti-inflammatory and balances the pro-inflammatory Omega 6 in the correct ratio. Omega 3's are also found in large concentrations in spermatozoa and are essential for maintaining cell wall integrity and preventing moisture/oil loss from the skin. Healthy skin means high quality fibre production. Prebiotics Prebiotics provide specific nourishment for the friendly, fibre digesting bacteria in the camelid's foregut to maintain good digestion and the release of nutrients for growth, breeding and production. Vitamin D3, Phosphorus, Calcium and Yeast Cultures Contains high levels of vitamin D3, available phosphorus and calcium in a very palatable form. All three are crucial for healthy skeletal development and additional yeast cultures are added to significantly improve the digestibility of phosphorus from normal feed. Bio-Available Trace Minerals Bio-available trace minerals are essential minerals, provided in a digestible form to supply the needs of productive animals. Trials with high levels of available zinc have shown very positive results with fibre quality. Selenium yeast has also been proven to be more available and twenty times less toxic than inorganic selenium, which is very beneficial to health. Nanotechnology Components and Simple Sugars “Oligosaccharides” Oligosaccharides are used to support the immune system by maintaining naturally high levels of macrophage activity to block harmful organisms being absorbed into the bloodstream. In conjunction with a natural, high quality forage diet the exposure to unnatural moulds and fungi will be reduced and if a problem, the active self-defence mechanism will deal with them. 1. Simply mix Camelibra NG-2 with fibre pellets and/or chaff. There are currently no questions for GWF Nutrition Alpaca & Llama Food Supplement - be the first to ask one!